Haley Meusy had a goal and an assist on Wednesday as Coronado’s girls soccer team earned a 3-0 home win over Foothill. Haley Meusy had a goal and an assist on Wednesday as Coronado’s girls soccer team eaerned a 3-0 home win over Foothill. Gianna Irungaray and Kaitlyn Kowalchuk each added a goal for the Cougars, and Alysa Caso had two assists. Taylor Book made two saves to get the shutout. 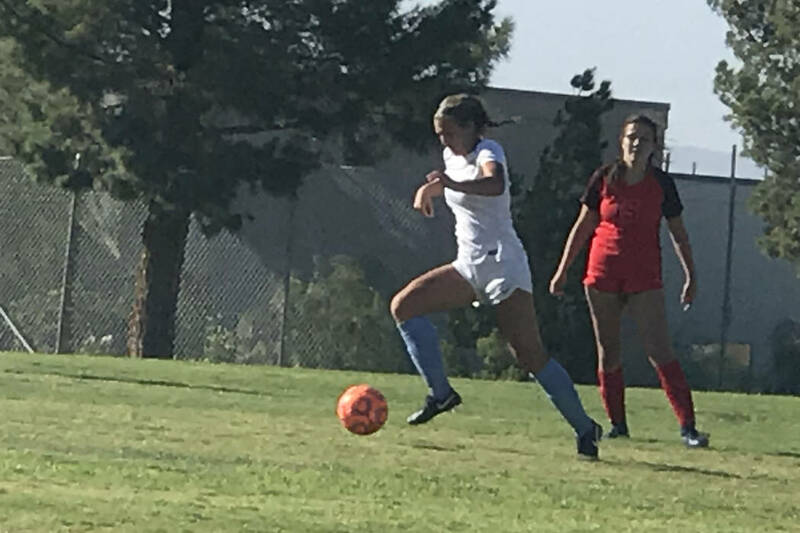 Palo Verde 2, Centenial 2 — At Centennial, Quincy Bonds scored two goals on assists from Marcella Bonds and Skye Kennedy as the Bulldogs rallied to tie the Panthers. Emily DelaEspriella and Alana Sullivan each scored in the first half for Palo Verde, which led 2-1 at halftime. Western 2, Virgin Valley 1 — At Western, Caro Acosta scored the game-winning goal midway through the second half as the Warriors rallied to edge the Bulldogs. Geraldi Gomez added a goal, and Devany Marroquin assisted on both goals for Western, which trailed 1-0 at halftime. Sarah Barnum scored for Virgin Valley. Shadow Ridge 3, Bonanza 0 — At Shadow Ridge, Taylore Simmons had two goals and an assist as the Mustangs beat the Bengals. Taylor Lee added a goal and an assist, and Trinity McDowell had an assist for Shadow Ridge. Cassandra Tolton and Tieg Simmons each played a half in goal to combine on the shutout. Pahrump Valley 3, Moapa Valley 2 — At Overton, Madelyn Souza scored twice as the Trojans edged the Pirates. Kiara Ramos added a goal for Pahrump, and teammate Makayla Gent had two assists. Lainey Cornwall and Madilyn Fairchild each had a goal for Moapa Valley. Cimarron-Memorial 5, Rancho 0 — At Rancho, Leanne Sawyer had two goals and two assists to help the Spartans shut out the Rams. Daniela Perez-Vazquez had two goals and an assist, and Katherine Caldwell had a goal and an assist for Cimarron. Anay Garcia-Reyes recorded the shutout with 10 saves. Las Vegas 7, Desert Pines 0 — At Las Vegas High, Brinkley McCoy fired in four goals and Ariana Sweitzer added a goal and an assist as the Wildcats blanked the Jaguars. Isabella Martinez and Ivannia Cabrera each tallied a goal, and Anna Bowen and Leslie Garcia supplied two assists apiece for Las Vegas, which led 3-0 at halftime. Larina Ibarra got the shutout for the Wildcats. Eldorado 8, Cheyenne 0 — At Cheyenne, Isabella Sama had a three goals to help the Sundevils shut out the Desert Shields. Angelica Lamas and Andrea Arias each scored two goals for Eldorado. Yeimi Prado-Castaneda added a goal, and Mia Ostler had three assists for the Sundevils. Cynthia Barreintos and Lamas combined for the clean sheet. Faith Lutheran 8, Legacy 1 — At Legacy, Madison Sonerholm had three goals and an assist to lead the Crusaders over the Longhorns. Riley Divich scored twice for the Crusaders, and Kennedy Lazenby had a goal and two assists. Gabriella Lancaster scored Legacy’s goal. Arbor View 9, Canyon Springs 0 — At Arbor View, Preshus McCraney scored three goals, and Carmen Endicott had two goals, as the Aggies blitzed the Pioneers. Amber Mallas provided a goal and an assist for Arbor View, which got one goal apiece from Taylor Hampton, Jaylin Shoning, and Keily Larosee. Brynn Covington notched two assists, and goalkeepers Krystin Cooper and Jillian Hudson combined on the shutout for the Aggies. 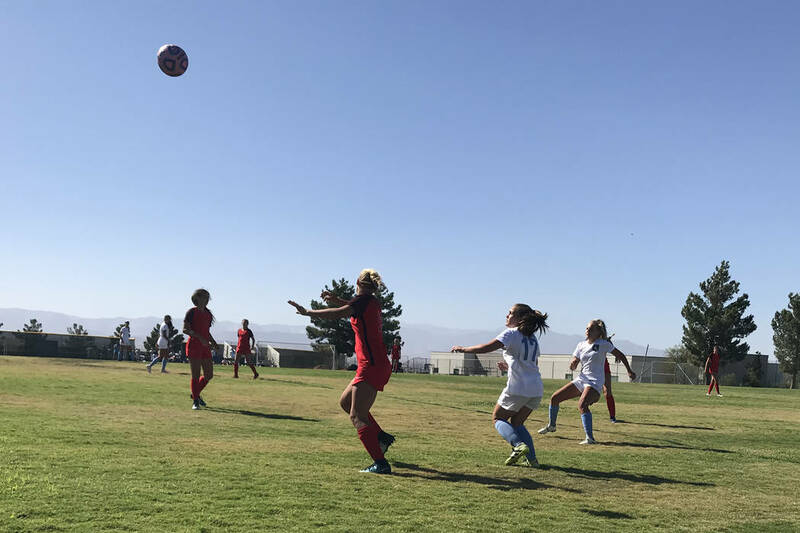 Boulder City 2, SLAM Academy 1 — At Boulder City, Makenna Arboreen and Sophia Legat each had a goal as the Eagles nipped the Bulls. Erin Taggard and Quincy Gibson each supplied an assist for Boulder City, which led 1-0 at halftime.